since we don't know for certain when each of our lost Tummymuffins left us -- and quite frankly, we'd prefer to remember them for life rather than death -- we've chosen to memorialize their due dates rather than when we found out they were gone. having a ritual letting go -- naming them and saying goodbye -- has been enormously helpful to us in healing. for me, i've felt that i can "leave" my child and not keep dragging them around with me in an unhealthy way, still knowing that of course they'll always be with me, both physically and emotionally; even as life moves on, their tiny lives are part of mine forever. and so our first one was left in one of the oldest churches in Rome, under a lovely mosaic. our second was left in a tiny ancient roadside chapel in Thomas' German hometown. as the date for our third approached, i wondered what to do or where to go, as we were here at home in Los Angeles. i only knew it should somehow be like the the other two: somewhere quiet and beautiful; a place that love and supplication have dwelt together with a holy Presence for a long time. 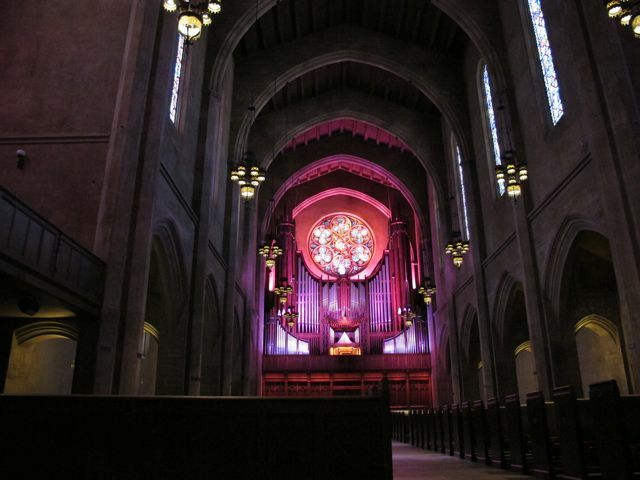 i emailed a dear friend who's been part of this journey from the beginning to ask about a chapel i'd heard of; she said it wasn't a good place for that sort of thing, but suggested that i look into another place that was special to her; the oldest Protestant church in L.A. in continuous service. i'd never heard of it before, so i called to simply see if they open the sanctuary during the week for people who want a quiet place of prayer & reflection. what transpired was nothing short of a miracle of compassion and grace. the senior minister's assistant, instead of saying "no" (which was the technically correct answer; a school is also on the church grounds so they cannot leave it open to the public), offered to personally let us into the sanctuary whenever we wanted to come, even giving me her personal cell phone number to make sure she didn't miss us. it seemed quite random, but that sort of generosity of spirit isn't something you say no to. as we drove to an address in the middle of the bustling, breakneck city of concrete and glass, i wondered how any place here could possibly be, well, special. when the GPS signaled us to to turn, it was obvious where we were going. rising out of the bland sidewalks and chunky office buildings was a gorgeous gothic-revival cathedral building, all vaults and towers and graceful arches. the minister's assistant, who met us at the side entrance, quietly let us in the side door. when we walked into the sanctuary, i knew we'd been sent to the right place. colored light spilled onto the stone floor from the numerous stained-glass windows, and a hushed peace seemed to be soaked into the walls. massive trumpet-like pipes (of what i was to later learn is the largest church pipe organ in the world) flanked both ends of the room. the warm, well-worn carved oak interior felt enveloping, in a comforting way -- it was indeed clear that the Holy had dwelt here for some time. the minister's assistant had thoughtfully arranged to have the pastor on duty available in case we wanted someone to speak with us -- were we interested? now, usually i would have reflexively said oh so politely: no, thank you, no need to bother, we'll be fine: but suddenly i realised -- these losses have changed all of that. could we have borne them without the support, love, prayers, encouragement, shared sorrow, and cheers of others? would we truly have "been just fine" without accepting that encouragement from even the most unlikely of places, without reaching out and asking for help, without turning to every source we knew for wisdom and comfort? NO. absolutely NO. and so of course i caught the polite response in my throat, swallowed, and said YES. we were sitting in silence, simply absorbing the beauty of the place and the gravity of why we were there when the pastor on duty, a smiling woman about our age, appeared, hands outstretched to us. she welcomed us and asked for a bit of our story; as we explained as best we could why we were there, a genuine empathy sagged her body as she listened. she asked if she could pray for us, and gathered our hands together. then she looked at me -- would i mind if she laid a hand on my belly, over the growing Tummymuffin IV as we prayed? she explained that when she was carrying her children, she found it comforting to have people bless her babies with a hand on her belly, but knew not all pregnant women like being touched. of course, i said, i want him or her to be part of this. and so we stood there in the middle of this lovely sanctuary in the improbable middle of one of the busiest neighbourhoods in sprawling Los Angeles, three strangers bound together by compassion and need, as she spoke honest and authentic words of blessing and mourning, conversing with God as a True Presence, the One whose love was there, surrounding us when we needed it the most. 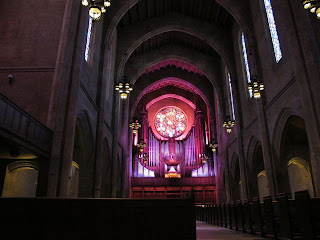 after she left us, we sat on the cool flagstones of the steps to the altar, looking at the massive rose window. i laid my head on Thomas' knee and cried for awhile, but it wasn't the kind of desolate, hollowed-out weeping that i've known all too well. instead, it felt like the release that it was, the familiar internal ritual of giving a name and saying goodbye to a child that i will never hold, and letting her go. goodbye my little Three*, i thought, thank you for letting me know you while i could. with timing that was both fantastically dramatic and delightfully comedic, the massive organ began thundering out a triumphant voluntary, the sort of music that plays in movies when the heavens open and the good prevails. somehow the tears kept falling but now we were laughing instead of crying. wow, she gets her own farewell soundtrack! i said. unbeknownst to us, we had somehow managed to come right before the organist usually begins his regular practice. so we stayed for a bit, sitting there with our backs to the organist, just listening to the music surround us in all its layers and complexity. if you've ever be lucky enough to hear an accomplished pipe organist play music specifically written for such a magnificent behemoth of an instrument, you'll know it's like hearing a choir -- so many voices, tones, rhythms, musical lines all at once. the melodies and harmonies poured from the pipes, like sparkling rain into an already-rushing river. it felt healing to just soak in it. driving home, Thomas looked at me. do you feel any different? he asked. i think so, yes, i replied. do you feel pregnant now? he asked. i laughed, but then saw he was serious. and i thought about it, looked inside, and yes -- there was a new feeling, a new lightness and a new acceptance of the fullness of my womb. and so i am learning: perhaps the most important part of letting go is making ready to receive. our deepest gratitude to Heather and Shanna of First Congregational Church of Los Angeles, who extended such compassion and love to two grieving people, and truly exemplify what it means to be a part of the family of God. *a week ago, slowly waking from a lucid dream, i saw in my mind a name i didn't recognize, but that still seemed oddly familiar. i couldn't shake it, so i asked the Googles and Wikipedia, which told me that it meant, depending on the language, either "The Third" or "Little Girl." and so i thought: well, i guess that's you, TM3. as for the familiarity? it's one of the few places in the stories of Jesus where the original language was preserved, and so we know when He gently and compassionately saved a family's daughter from death, this is how he addressed her. so now, my third little leap of the gazelle, my little girl, i will always remember you as Talitha. I love the name Talitha, it is lovely. Thank you for allowing us to join in your journey. Prayers continue. love you. this is so beautiful. oh, and !!!!!!!!!!!!!!!!!!!!!!!!!!!!!!!!!!!!!!!!!!!!!!!!!!!!!!!!!!!!!!!!!!!!!!!!!!!!!!!!!!!!!!!!!!!!!!!!!!!!!!!!!!!!!!!!!!!!!!!!!!!!!!!!!!!!!!!!!!!!!!!!!!!!!!!!!!!!!!!. Oh, I am crying heavy tears for this farewell. Thank you for taking us with you to the church. You are learning to be so vulnerable! Boy are you making the most of this journey! I hope I would be as courageous and wise. It is also wonderful to see Thomas be so loving. Not having the fortune of getting to know him, it is heartwarming to see how devoted he is to you. So happy you have each other. Farewell, Talitha. It will be sweet when we meet! Your mother is a beautiful soul. This is so beautiful, just like you are. Your vulnerability is like an invitation to know you more, and to share in your pain, and to hurt and rejoice with you as you walk this road. Keep on sharing. I love you!